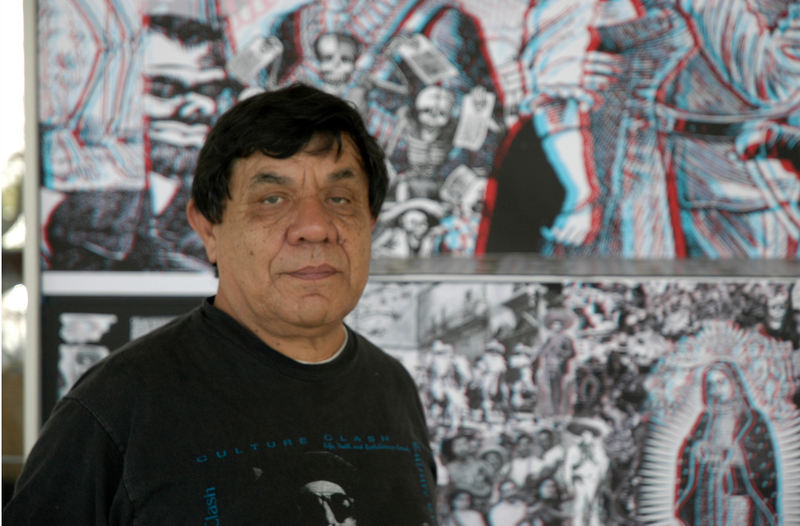 Rene Yañez in front of his 3D piece, part of Illuminations: Día de los Muertos 2011, opening reception Oct 7 at SOMArts. Mission Loc@l: What brought you to the Mission? René Yáñez: I was in San Diego and then I was drafted in the army [Vietnam War]. After I got out in 1966 I came to the Bay Area to go to school. It was a very exciting place. I worked for La Causa — it was an education house helping Chicano students get to UC Berkeley. I worked for the Art Commission, helped get Galería de la Raza started. Lived in the Mission, worked in the Mission ever since. ML: Did you think you would become an artist at a young age? RY: Well, I always had those aspirations. My father was a merchant but he did art. Then my brother became a successful commercial artist/designer. I kinda liked what he did. Now he was making a lot of money. I was surrounded and also attracted to it. Going to school [at California College of the Arts and Crafts, Merritt College, the San Francisco Art Institute] and working with it, I found a certain richness. It was the ’60s — it was very exciting. ML: Back in the ’70s you experienced resistance from mainstream art institutions. As a result, Galería de la Raza was created. Do you think artists today experience resistance in their art work? RY: It’s a different time. It’s changed. It’s a matter of audience, population shift. You have to understand, in the ’70s it was very much a Chicano, Latino population audience. There’s been shifts. Also, people are more digital, electronically oriented. There’s also Republicans. It’s starting to [be a] cultural divide — cultural wars, about deciding what is culture. ML: So you mentioned technology. How does an artist succeed in this new technology of art? RY: I’ve been around for a long time. One thing I understand is that making a living as an artist, you have to be very versatile. I work in theater and comedy groups. I work with my son [Río Yáñez] in 3D. Just experiment how to deal with the audience. I’m coming up with new ideas constantly. I’m curious. I work with a computer, but I also prefer to work with my hands. Still, there has to be that balance for people, both creatively, spiritually. ML: What advice do you have for someone who wants to be experimental yet still relevant and accepted? RY: There’s issues. There’s targeted issues on how to approach certain things. Like back in the Galería, I did an anti-apartheid exhibit and helping organize boycotts and protests for the black community and mapping it out. You have to think of a problem and how to approach it. You have to think how to reach a large group of people, convey a message, but not preach to them and sometimes how to make people wonder. It’s a trick. ML: What advice do you have for artists about thinking critically in creating their art so people can take something away from it? RY: Sketch it out. Put some thought behind it. Choose your medium — is it going to be photography, collage, painting or poster? What medium and how are you going to resonate what you want to say? Some people use art exhibits, installations. Some people use street art, stickers and silkscreen posters. Now social media — it’s become another avenue, it’s reaching a lot of different people. Experiment. Also try to work with a group. Try to understand audience communication. ML: You are known for bringing Día de Los Muertos to San Francisco. What advice would you have for someone who wants to bring his or her own cultural celebration to America? RY: Back in 1972, I was experimenting again. People come from other countries, there’s a need for ritual, spirituality, cultural expression. My advice is to put it out there and see how people react. Things grow. I started doing the procession, and it’s taken a life of its own and what have you. ML: Which artists influence you and your work? RY: Growing up, Walt Disney. The richness and color, and all that content aside, he was a communicator building Disneyland and being able to work with large teams of people and artists. Diego Rivera — it was through studying him that I became acquainted with Frida and started noticing her work. Frida had a certain influence on what I did. Warhol, Basquiat. When I was growing up and going to school, there was so much around music — the Beatles, the Stones, B.B. King. I liked Toña la Negra and Bob Dylan. I got enjoyment and wisdom from both of them. ML: How do you stay stable and keep making money as an artist? RY: I work part-time at SOMArts and I freelance the rest of the time. I do the Tortilla Conspiracy. I try to work with this fellow Guillermo Gomez Peña and Richard Montoya from Cultural Clash, discussing projects and trying to raise money. Pitching to people, and they say yes or no. To me, I’d rather do that than write grants cause grants are a crapshoot. Every month it’s a struggle to survive. But I’m glad to be working with my son. I’m also learning from him. He’s really savvy on the computer. ML: What’s your daily schedule like? RY: [Laughs] Well, it comes and goes with projects. I make a lot of phone calls. I have a computer. but I prefer to make contact with people. I think about ideas [for] my artwork. I plan my day, working at SOMArts, curating, seeing the artwork. I get together with my friends. We talk about art, times, politics, Obama. So it’s a constant thing about keeping current, communicating and trying out different ways. These projects — it’s sympathetic that I don’t have a large budget and I’m rather ambitious with my projects with a small budget. It’s a gamble. ML: What is it about the Mission that you love and that keeps you here? RY: I think the diversity of the people. And meeting new people of different backgrounds that I find really interesting and that inspire my art. Also, being able to do things like the tortilla conspiracy. We do fundraisers and we pass the word. That to me is really worth it — the kind of people I get to work with. ML: What’s the best piece of advice you’ve ever received? RY: [Laughs] Well, one of my art teachers at school said to work hard. Being an artist is very hard. Whatever you do, you have to plunge into it with all passion, because it’s certainly not for the money. It’s gonna be more for self-satisfaction. Learn a lot of different skills, because everything is changing. I feel that I have to reinvent myself every other year and think of things to do. ML: Now, in 2011, what advice do you have for budding young artists? RY: Me, give advice? [Laughs] Do what you like and be passionate about it, because you can’t be mediocre and be successful at it. Try to be as diverse in your skills, from computers, theater, performance, set design — all different aspects — because if you can’t get one thing, something else will come out. Learn to work with lighting persons, technicians, sound persons; it’s very important. Text — learn that language, how to communicate with text, because if you want to take the art to a certain level you have to become very technical, too. Taking courses and keeping up. Friday, Oct. 7, is the opening for SOMArts’ Dia de Los Muertos exhibit, with 30 altars by more than 80 artists. It runs through Nov. 5. The opening reception for Illuminations is actually Friday, October 7th. The caption currently says October 8th.